The largest convoy yet of armed fighters and civilians left a devastated pocket of Eastern Ghouta early yesterday, further emptying the one-time Syrian rebel bastion. Government troops, backed by Russia and loyalist militia, launched a ferocious assault more than a month ago to retake the enclave on the outskirts of Damascus. They have recaptured more than 90pc of it and are draining the last rebel-held pockets through negotiated withdrawals brokered by Russia. Two such deals have already seen thousands of rebels, their relatives and other civilians bussed out of bombed-out Ghouta districts to Idlib, a north-western province most of which still escapes government control. The largest numbers have quit the towns of Arbin and Zamalka and adjacent district of Jobar, controlled by the Faylaq al-Rahman Islamist faction. It reached a deal with Moscow last Friday and its implementation began the following morning with nearly 1,000 people boarding buses and leaving. The numbers have grown steadily since, with the biggest convoy yet departing yesterday after boarding under supervision of Russian military police. 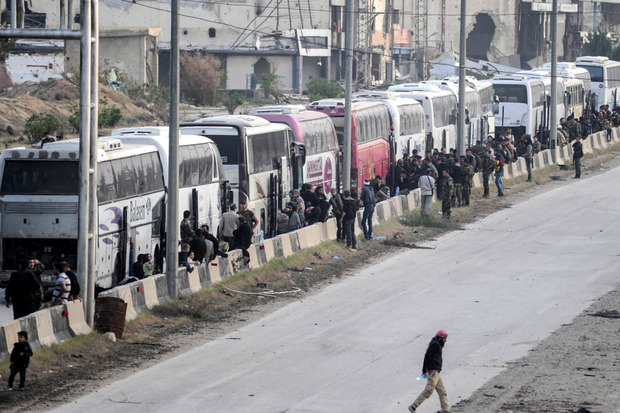 A hundred buses carrying 6,749 people - around a quarter of them fighters - left the Faylaq-controlled pocket in the early hours of yesterday, state news agency SANA said. That brought the total number of evacuees from the pocket to 13,165, and more departures were expected later yesterday. President Bashar al-Assad has used such evacuation agreements to recover swathes of territory since the uprising against his rule began seven years ago. They have usually begun with the military encirclement of an area, followed by bombardment and a ground operation before a deal is reached. Eastern Ghouta lies within mortar range of Damascus, and rebels had used it repeatedly as a launchpad for rocket attacks on the capital. The regime responded with a half-decade siege of the enclave's 400,000 residents, sealing off access to food and medicine.